DARLINGTON CATCHER Kennedy Wagner (#22) drives the go-ahead, two-run double during the Redbirds’ six-run seventh-inning rally in Tuesday’s game. 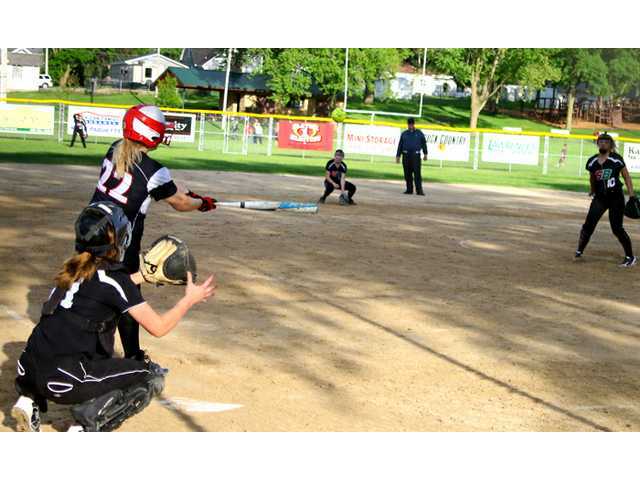 POSTED May 31, 2018 10:43 a.m.
SHULLSBURG — Leading 9-3 at home with just two innings remaining, the #8-seeded Shullsburg/Benton co-op appeared headed for opening round playoff victory for the third year in a row. However, the #9-seeded Darlington Redbirds showed they had no quit in them by rallying for nine unanswered runs over their final two turns at-bat to stun the host Miner-Zephyrs, 12-9, in a WIAA Division 4 regional quarterfinal game played at Badger Park on Tuesday, May 22. “The come-from-behind win speaks of the character of this year’s team. There is no give up in those girls and that was true against Shullsburg-Benton. They kept their cool, had great at bats and chipped away one at bat at a time. They really learned how to fight this season and that is what they were able to do in that game,” said Darlington head coach Molly Rice. The Redbirds (3-20 overall) plated three runs in the top of the sixth inning to cut the deficit down to 9-6, and then struck for six runs in the top of the seventh to grab a 12-9 lead. Pitcher Alyssa Tuescher drove in two runs in the sixth to help her own cause, and the ‘Birds opened the seventh with a single and four walks to pull within a run. Lucy Heinberg scored on a wild pitch to tie the game at 9-9, then catcher Kennedy Wagner gave Darlington its first lead with a two-run double. Bethany McDonald capped the seventh-inning rally with a RBI-single. Tuescher (3-19) retired the Miner-Zephyrs (5-15) in order in the bottom of the seventh, recording back-to-back strikeouts for the final two outs to secure the victory. The Miner-Zephyrs started off hot, scoring four times in the first and once in the second to jump ahead 5-0. The hosts added three runs in the fourth and another in the fifth to extend the lead to 9-3. “We started the game off very strong both defensively and offensively. Darlington’s defense early on had some plays that went against them; and, fortunately for us, we were able to get on base and score some runs. Unfortunately, we started getting too anxious to hit and their pitcher recognized it. She threw a great change up and got our girls swinging before it was even to the plate. Darlington was disciplined and did their jobs at the plate. They earned their hits and did what they came there to do to– win the game,” said Shullsburg/Benton coach Nicole Brant. McDonald went 3-for-5 with two runs driven in to lead the Redbirds. Chloe Muhlstein, Wagner and Tuescher each tallied two RBI, while Heinberg had a double with a RBI and three runs scored in the game. Holly Ray, Laura Sturtz and Kaylyn McGuire each scored twice. Wrapping up their prep careers on the diamond for Shullsburg/Benton on Tuesday were seniors Kindle Cook, Kennedee Mick, Savannah Hilby, Miranda McAuliffe and Catrinia Fagan. “I can’t say enough about them and what they brought to the team. Kindle Cook has a passion for softball and often came in clutch when needed. They brought the team together and they built great friendships with the other girls,” noted Brant. Darlington advanced to face top-seeded Mineral Point in a regional semifinal game at MP’s Soldiers Memorial Park on Wednesday, May 23. The SWAL champion Pointers scored twice in the second inning to take the lead for good, and then plated four runs in the bottom of the fourth to open up a 6-1 advantage. Kyla Lindsey drove in two runs and scored once for the Pointers, while Maddie Williams, Dana Schmitz and Miranda Ollerich each had a run and a RBI for the hosts. Kennedy Wagner went 3-for-3 at the plate to lead Darlington. Ray singled in the Redbirds’ first run in the third inning, and Chelsie Golackson doubled in the team’s other run in the sixth. “The game against Mineral Point was competitive and we played tough on both sides of the field. They went into that game ready to compete and that is exactly what they did. We had the base runners, but just couldn’t get that extra hit to bring the spark we needed,” noted Coach Rice. Playing in their final prep game for Darlington on Wednesday were seniors Chelsea Golackson and Gabby Steiner. “The two seniors we had on varsity were huge assets to our team. We were lucky to have Gabby join our team this year and step up with some big plays in the outfield and clutch hits. Chelsie is our only returner senior and has brought so much to this program. Her dedication, leadership, and play on the field is what every coach wants in a player. Both girls will be greatly missed next year,” Rice replied. Leading Hitters: D– Chelsie Golackson 2x4, Kennedy Wagner 3x3. 2B– Golackson. MP– Lindsey 2x4, Kinch 3x4, Williams 2x3. 2B– Oellerich. Lindsey, L. James. W- M. James (4IP, 3H, 1R, 1ER, 7K, 4BB). L- Alyssa Tuescher (6IP, 11H, 7R, 6ER, 1K, 7BB). Leading Hitters: D– Bethany McDonald 3x5, Chelsie Golackson 2x4, Lucy Heinberg 2x3. 2B– Heinberg, Wagner. S/B– Lydia Jones 2x4, Joleeza Rice 2x4, Brianna Jones 3x4. 2B– Rice. W- Alyssa Tuescher (7IP, 9H, 9R, 6ER, 2K, 1BB). L- L. Jones (6.33IP, 8H, 12R, 12ER, 4K, 8BB).